There's still hope for Real Madrid in La Liga, even though their last obstacle ended up posing them more problems than Ancelotti certainly expected. The Merengues have beaten Sevilla 2-3 at the Sánchez Pizjuán and will continue chasing Barça while still behind them by 2 points. 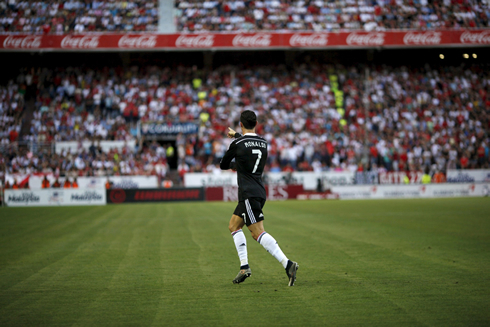 Cristiano Ronaldo with an hat-trick, scored all 3 goals for his side. It was a crucial win for Real Madrid in their La Liga campaign this season, who got to defeat Sevilla by breaking their unbeaten run at home this season, in what was a very complicated 2-3 win. The Merengues were always on the lead tonight and truth has to be said, they have much to thank for that to Cristiano Ronaldo. The 30-year old forward scored an hat-trick and reached the 42-goal mark in La Liga this season, which allowed him not only to end his recent goalscoring drought of 3 games in a row, but also to recover the top spot in the league's Pichichi standings, now 2 goals on top of Barcelona's Lionel Messi. As we prepare to enter the final stages of this season in La Liga, everyone knew Real Madrid had no margin for error in tonight's visit to the Sánchez Pizjuán. In front of them, a team who hadn't lost a single game at home this season and who were also in a desperate seek for points, as they attempt to try finishing in a Champions League spot by the time we reach to May 24 (La Liga's last gameday). Just like it had happened against Atletico in their Champions League quarter-finals 2nd leg clash against Atletico, Carlo Ancelotti opted by playing Sergio Ramos in a midfield role and once again, it appears his gamble turned out to be quite fruitful. Illarramendi on the hand, was relegated to the bench in another vital game for the Merengues, in a clear sign that he has probably lost his manager's trust. This Sevilla vs Real Madrid match brought us a quite open game right from the start, with the two sides creating plenty of chances to open the score in the first half hour of the clash. We would have to wait 36 minutes to see the first ball going into the back of the net though and as usual, it would be Cristiano Ronaldo breaking the deadlock. The Portuguese striker showed off his true killer instinct inside the box and when he saw Isco's long cross coming his way, he positioned himself in the right place and headed it past Sergio Rico for the first time on the night. Great goal from the former Manchester United star, who would score a second just one minute later. This time though, the cross came from the right and was delivered by James Rodríguez, to then be deflected by Chicharito's header and fall near the far post. Ronaldo was there and lurking again, more than ready to put Real Madrid two goals up. But Sevilla wouldn't exactly give up at that point of the game and managed to cut distances when we were already playing in the first's half extra time. Sergio Ramos miscalculated a sliding tackle inside the box and ended up tripping Aleix Vidal in an unnecessary manner. It would be Bacca stepping up to take the penalty and he didn't find any trouble to beat Casillas and set the score in 1-2 before half-time. Judging from what we had seen in the first 45 minutes, the second half was promising some great moments of football. Let's just say that despite not many goals ended up being scored after the break, it sure didn't let us down in terms of excitement and end-to-end scoring chances. But it was Real Madrid who reached their third goal first and around the 68th minute, when a Gareth Bale cross found Ronaldo ready to pull trigger and again from the far post. The 2014 FIFA Ballon d'Or winner brilliantly lobbed the ball over Sevilla's goalkeeper with a clean header, his 14th of this kind this season. The hosts still got to reduce the differences to a single goal 10 minutes later, when a low cross from Aleix Vidal on the right allowed for Vicente Iborra to finish it off with a strong strike already inside the box. Not much Casillas could have done there and from that point on, Sevilla were about to increase the pressure in chase of the equalizer. However and thanks to a bit of fortune too, Real Madrid held down the fortress and secured 3 very important points in their quest for the Spanish League title. Cristiano Ronaldo next game will be for the UEFA Champions League against Juventus, on the 5th of May of 2015. You can watch Juventus live stream, Juventus vs Real Madrid, Barcelona vs Bayern Munich, Tottenham vs Manchester City, Chelsea vs Crystal Palace, and Mainz vs Hamburg, all matches provided from our soccer streaming live game pages.